Sun following digital nomad is well equipped for The Workshop. 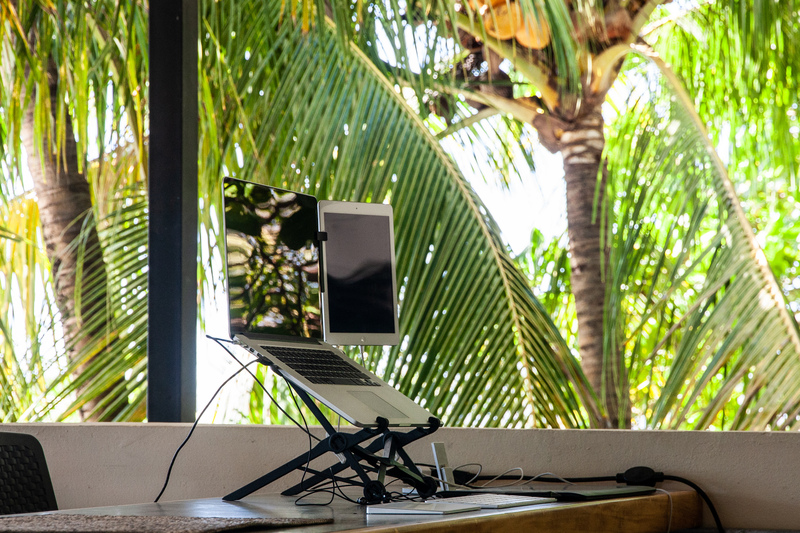 Lasse Adolphsen recently rocked up to The Workshop and put up his streamlined little work station consisting of his Apple laptop, attached Ipad, stand and electronic drawing pad. This man looks like he means some serious entrepreneurial-nomad-business. 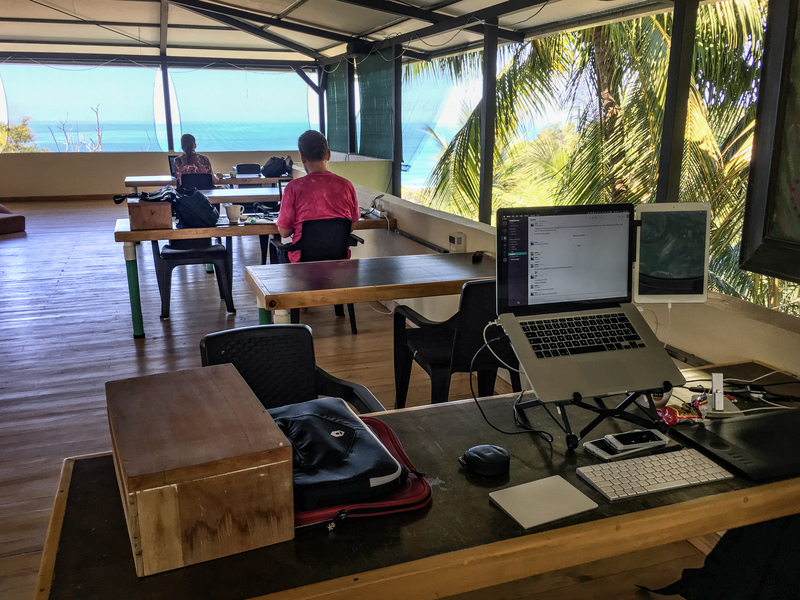 This well-travelled Danish guy is fully portable, after spending many winters abroad in warmer climates he has well adapted to using co-working spaces, not to mention he has a great tan following the sunshine around the world. Lasse jokes “I was probably one of the first digital nomads”. He explains that he set up a workspace in Kenya and hooked up the internet with 1mb line many moons ago. His career in digital design started at 12 years old – while some kids had paper runs he was offered a very important role at the dinner table. His uncle showed him a computer drawing program and after having a play Lasse was offered a job at his uncle’s real estate firm drawing the floor plans for apartments that his uncle had on the market. Lasse explains that all of this was before the internet of course, so the process was - he was faxed through a rough sketch, created it on an old computer with this new fandangle software and saved it to a floppy disk and posted it to his uncle’s office where it was printed. When the internet started he explained to his uncle that there was this thing called email and that he could now send the files instantly, his uncle was at first dubious but then trusted this Dougie Howser whizz kid of this new miracle internet thingie. Lasse was pretty schmick as a teen, he had his name and business on his door and everything. I didn’t ask him about the ladies but I’m imagining him with a shirt and tie buying all the girls milkshakes down at the dairy – I digress. After 10 years in the job, his brother took over and the important child labour was passed on. Lasse was very grateful of his job with his uncle as it saw him through paying his way through his educational years. He completed his studies and was now a Multimedia Integrator. Part of this course meant that they had to have work experience, his uncle had recently sold out his company to a huge player in the real estate field in Denmark and was able to recommend him. Lasse went on creating animated content onto the web using flash plugins, things like images of apartment complexes not yet built was his jam and as you could imagine at the time this was very much a revolutionary marketing tool for the agents. Lasse decided to be self-employed from 23 picking up many roles as an interface designer for many companies in Denmark, creating functional design for websites and apps. This has meant his workload has increased in this thriving digital age and his world has opened up to be able to travel. Lasse leaves his house and escapes the Danish winter darkness every year to work at co-working spaces all over the world. Places such as Spain, Portugal, Florida, Costa Rica, Bali and now Auckland, NZ. One of his most memorable was in Costa Rica where the bus took him through the mountains, over water and through the jungle, over rickety bridges until he arrived at a makeshift co-working studio on the top floor of some guy’s house looking over the beautiful Pacific Ocean. What Lasse loves about The Workshop space is that it isn’t crammed with people, it’s bright and open, he feels like people don’t talk constantly as they are more mature in this office, this means that he can be more productive. He also likes the fact that it has everything you’d need like a shower and at-home-type kitchen set up.